Are you looking for a flexible work schedule where you have summers off and you can enjoy time with your children during their school vacations? Are you interested in working in your community? Are you a stay-at-home parent who wants to supplement your income? Do you want a job were you can wear jeans and tennis shoes to work? If any one of the above is true, driving a school bus may be just the opportunity you are looking for! 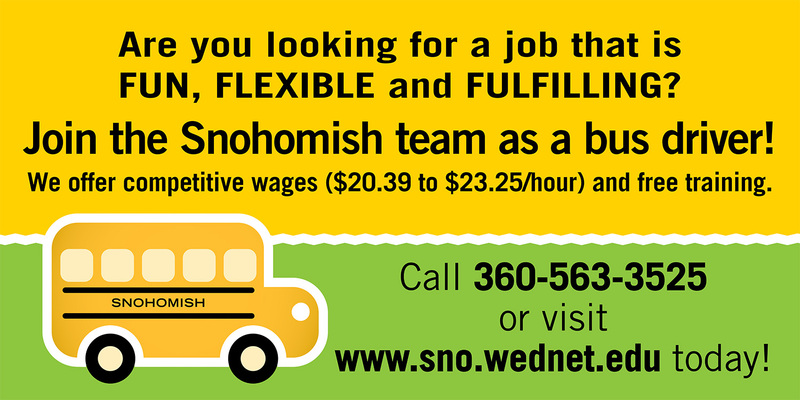 The district’s Transportation Department is seeking substitute school bus drivers. We have openings in our summer training class. Screenings for potential candidates will begin in mid-June, and training classes will begin in early July. The class will last approximately 3 1/2 weeks, and the commercial driver’s license training is free. We offer competitive wages and free training for Class B CDL endorsement. If you are interested in working with us, please go online and apply today. Please call 360-563-3525 with any questions. The job posting can be found by clicking here under the "Classified" tab.